It was a Wednesday afternoon, and I was sitting down to make a meal plan. The kids excitedly gathered around me, wanting to give their input on our next week of meals. Breakfast was the first order of business. I’d grown so tired of our not-as-healthy-as-I’d-like options (too many days, the kids were making homemade oatmeal cookies or coffee cake because it was easy and they liked it — not horrible, but…). We needed a new plan. After much googling of ideas, and hating most of them, we came up with our simple “Breakfast Bar” idea. We would make whole wheat tortillas, and stuff them with various toppings, both sweet and savory. The kids were thrilled. As we were planning our filling options, I realized that for our sweet choices, we’d be better off using crepes instead of tortillas! And so, our breakfast plan was born. 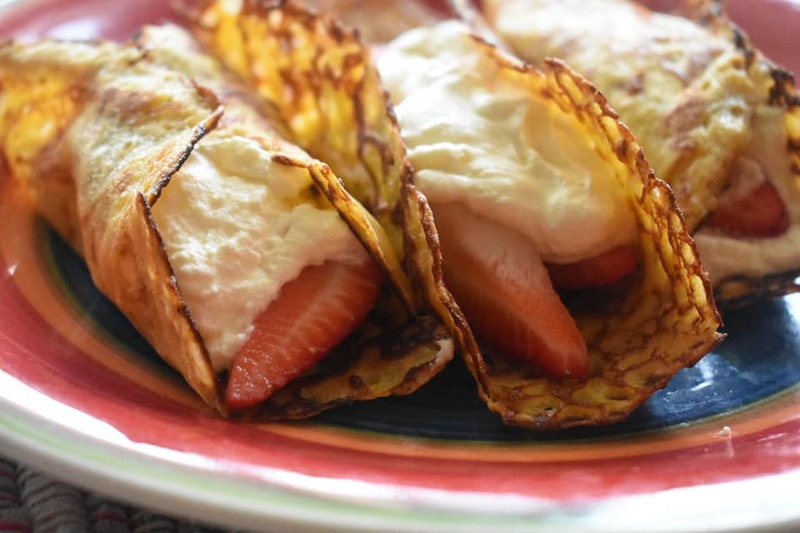 The next day, we looked over several crepe recipes, gave one a shot, and tweaked it a bit until it was just how we wanted: light, fluffy, and incredibly tender, with great flavor. It was love at first bite for the kids, who probably each ate 5 of them. The rest (of our quadruple batch…) were placed in the freezer for other breakfasts. 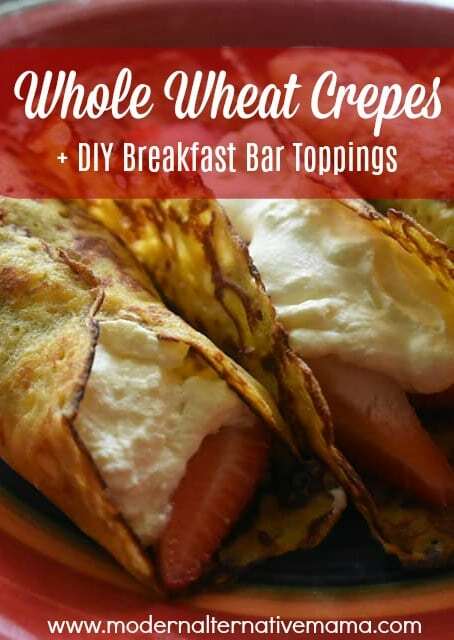 Whole wheat crepes are awesome. They’re largely based on milk and eggs, with a bit of flour in them to form a thin batter. They use very little sweetener, too, so they’re very healthy. If you don’t do grains, you can easily swap in coconut flour (just use less; I’ll note that below). These can easily be dairy-free as well. Eggs can’t really be swapped out though, so these won’t work for those with egg allergies. Please note — the first 4 – 5 that you make will likely stick and create an awful mess. This is normal! Keep adding butter before each crepe and as the pan gets well-greased and properly heated, the crepes will stop sticking. Don’t feel like a failure when your crepe comes out as a ball of eggy mess…that’s just how it goes. I used two different frying pans so I could get through the batches faster, and both had the same break-in time…even though I started the second one after I got into the rhythm on the first one. It’s just how it is. We’re using tortillas for this for our savory fillings, as I mentioned at the beginning of the post. I’ll share that recipe soon, too. We’ve been trying to perfect a tortilla recipe for awhile…and I think I have finally done it. Story for another day…. Use these to create your own combinations! We liked strawberries and cream (pictured above). Some of the kids enjoy chocolate-hazelnut butter (it’s like real food Nutella) with banana. Get creative! That’s it! This has simplified our mornings (and made them tastier, too). My kids love sweet breakfasts — and I love that these are all naturally sweet with fruit and honey, not sugar. I love savory breakfasts, and am very happy with my new ‘pizza’ burrito! 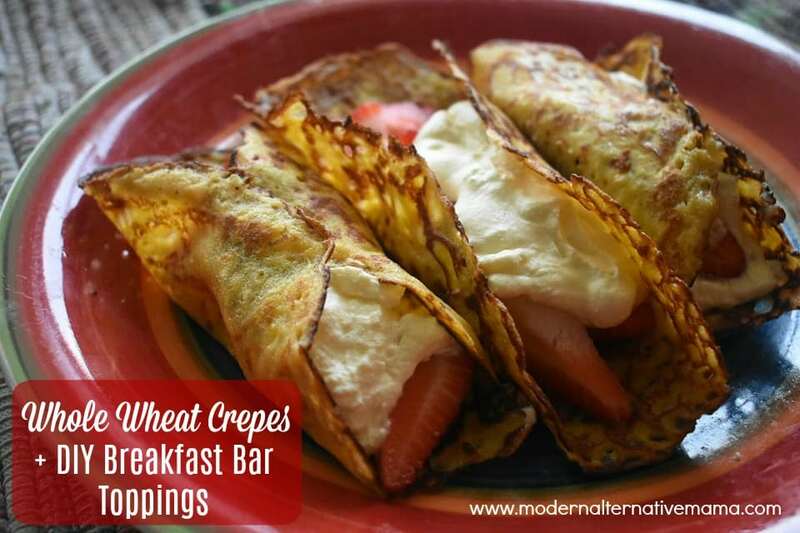 Do you like whole wheat crepes? What are your favorite fillings?